*Please book your participation in advance to avoid last minute rush. 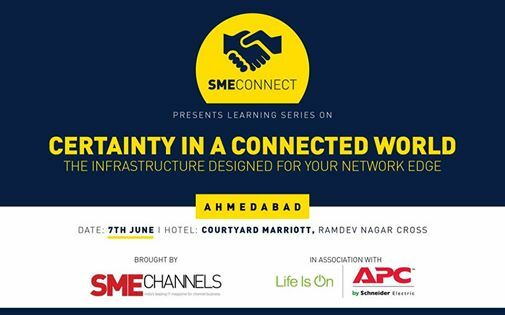 7 City Knowledge Series on Information Technology Infrastructure which is a Knowledge & Networking event happening in Ahmedabad. The event will give you an opportunity to expand your knowledge about the IT infrastructure architecture to enable your network edge and to run your futuristic applications like IoT, Business Intelligence (BI) and Cloud Computing seamlessly. There will be senior resource persons from Schneider Electric IT Division and experts from SME organisations including IT Heads and CIOs who live the situation on daily basis. These technology veterans will form the panel to deliberate on the ‘IT infrastructure needs of SMEs’. The evening will provide you with a platform where you can ask the experts about your current IT challenges and learn best practices to adopt in the future.